As a soon-to-be bride, my days are filled with so many magical moments. Moments where I feel the prettiest I’ve ever felt. I have never had such an intense plan for what I will look like on a single day in my entire life: facials, nails, hair, make up, lashes, teeth whitening, tanning, a workout regimen. Yikes, I get exhausted just typing all of that out and yet it’s all in the grand plan to look my best on our big day. But I would be lying if I said these days haven’t also been some of the most intense days of comparison I have ever experienced. I never realized how comparison has taken such a firm grip on my mind and my heart. I have filled my instagram feed and pinterest boards with unattainable beauty, and extreme expectations of what I should look like on my wedding day. I have let it creep into the way I view myself and I have let it taint some of those “magical moments”. A few nights ago I had a dream that I had forgotten to whiten my teeth in time for our wedding. (this is embarrassing to share). And I woke up in a panic. Let me make that clear, I panicked over not having my teeth whitened… This can’t be good. My mind has been so focused on the aesthetics of the day, that I’ve lost sight of the heart of the day. I look at other brides and other perfectly executed wedding and I panic that I will never be enough. That my day will never be enough. We tend to compare, yes we. We’re women and we tend to believe our beauty is diminished by the beauty of others. So because her hair is long and wavy and beautiful, your short and straight hair cant be. How do we even think like this? Different doesn’t equal less than, and I don’t know when we started to believe that it did. Beautiful. You are, I am, we are. Beautiful and loved and cherished because He says we are. The creator of the universe created us in his image, unequivocally unique. He calls us His beloved and because He says, it is so. And I refuse to believe anything else. The truth is, I could marry Jake today. Just as I am. With the details I have planned, and not a moment of planning more. I could marry him with my teeth not whitened and my pale skin. Without fake lashes and my roots peaking through. I could marry him just as I am now and he would still vow to love me forever. I would feel beautiful and loved and cherished, because I am. Being a bride is not so different than just being a woman. There is always going to be pressure to look our best and be our best at all times. There are magical moments within each day that seem to be tainted by our lack of self love (ever missed out on a photo because you didn’t like how you looked?). And those moments are no longer allowed to be affected by our need for perfection. Perfection is impossible. You are real and that is enough. Your messy hair is a sign of a day well spent. Your mismatched outfit means you just spent extra time with your kids rather than getting ready. That is beautiful. 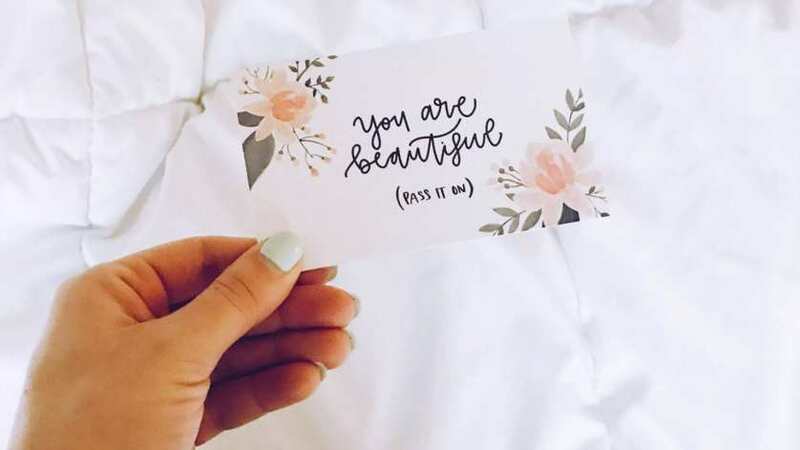 You are beautiful. Just as you are. Not just for that gorgeous hair, or that bright smile. But most importantly for that big heart. That big heart makes you more beautiful than any mascara could, and it’s time we start pampering that heart more than our face. So pass it on, because I don’t think we get told it enough. Let’s be women who encourage more than we compare.